PC component price declines are always good news for PC enthusiasts and upgraders. Some key component prices are rather high right now, notably DDR4 RAM and graphics cards. Meanwhile, the CPU market is pleasingly competitive and SSD storage prices look set to continue a downtrend which started around the beginning of the year. 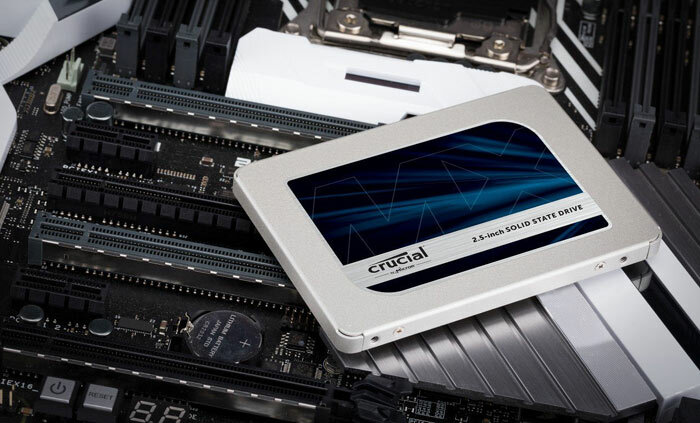 If you run a middling PC that still relies upon an HDD for boot/apps, then an SSD of any type will give the system an immediate noticable performance boost - and SSDs are trending to their lowest ever prices. 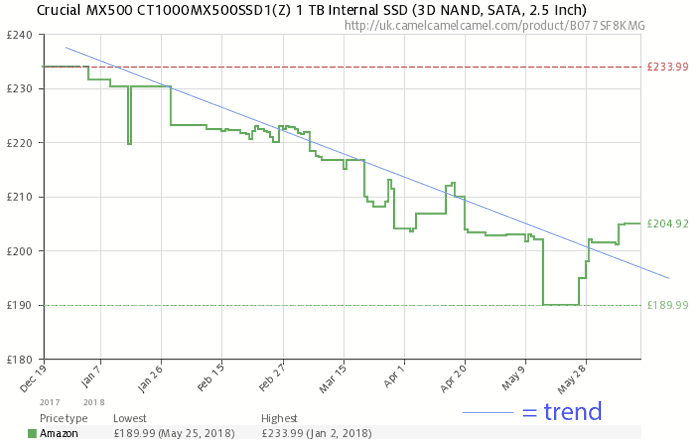 I've been checking through various 250GB, 500GB and 1TB models on uk.camelcamelcamel.com to see the price trends over recent months. One of the most recent bare drive SSD reviews on HEXUS is of the Crucial MX500 (1TB) and checking out this and other capacities in the family all show a similar downtrend. On the UK's 3xcamel site you can see for yourself (If you live in a different country click the flag at the upper right of the 3xcamel site to change location). See my screen capture below. So is now a good time to buy an SSD? It isn't a bad time but, as in the world of share dealing you should "let the trend be your friend" and there is no reason to believe prices won't continue to deline. In fact DigiTimes today reports that "NAND flash prices will continue to drop in the third quarter of 2018 as suppliers scale up their 3D NAND chip output". The Taiwanese IT industry journal says that new capacity is coming online thanks to chip suppliers' migration to 3D NAND technology and advanced process tech, leading to oversupply. Another negative affecting NAND producer profits is said to be the release to market of "substandard NAND flash chips," which has impacted the whole of the market, due to confusion. Meanwhile demand from smartphone makers hasn't been as strong as some had expected. And this 'perfect storm' is happening as "suppliers already built higher-than-usual chip inventories in early 2018 as they were more optimistic about the market demand this year". Looking further ahead, oversupply "will become severe between the fourth quarter and the first quarter of 2019, when seasonal factors are taken into account," according to the DigiTimes sources. In the short term this will be good for NAND-based product buyers, with the price decreases, but there are warnings that the reduced income for NAND makers could cause some to buckle - selling up, selling out, or simply collapsing. If the 1TB SSDs drop below the £150 mark, I have to wonder what that will do to the HDD market. Hopefully kill it dead and force-flood the market with affordably sub-£100 multi-TB SSDs…!! Keeping up with The Future has kinda left me stuffed, as I have a lovely case that I cannot make proper use of, because despite having 4xSSD side-mounts I still have to keep the HDD cages in place, which blocks off the front rad mount! Integral 120GB SSDs from MyMemory.co.uk for £24.99 are a good price right now. They are ideal for upgrading pupil PCs at the school I work at. (the PC only holds the OS and a few apps, all data is held on a central server). Now what do I do with this growing pile of old 160GB HDDs ? Probably a lot, ssd isn't exactly new tech now, and yet the inflated prices etc? sure if your after new nand tech expect to pay more but the old ssd tech isn't new and still expensive.